Simple Egg Bhurji, this is nothing but a scrambled egg which we make as a side dish for bread or chapati. I still remember, when I was in hostel, many days we have survived with this egg bhurji and bread. When ever we did not like the breakfast or dinner, the next minute we'll make this scrambled egg. We used to eat this with everything like bread, chapati, even with rice :) This is one of the simpler version of egg bhurji, we can also make this by adding different vegetables. Onion (Medium Size) - 2 No. 1. 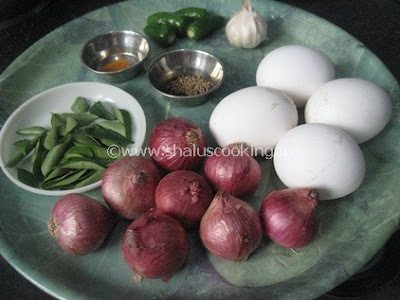 Keep all the ingredients ready to make egg bhurji. Finely chop the onions and green chilies. 2. Heat oil in a pan and add mustard seeds. When mustard splutter, add the cumin seeds. Once the cumin seeds sizzle, add the chopped onion, green chili and curry leaves. Saute till the onion turn transparent. 3. Add turmeric Powder and salt. Mix it well. Break the eggs one by one and add it to the onion. 4. Mix the eggs after adding each egg. After all the eggs are added, stir it continuously. 5. Keep stirring till the egg is completely cooked and doesn't stick to the pan. Easy and Simple Egg Bhurji is ready to serve with bread, chapati etc.